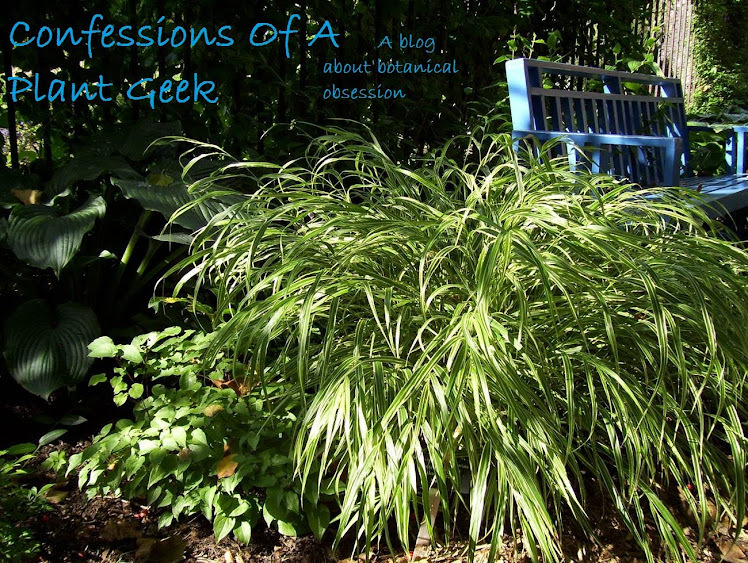 Confessions Of A Plant Geek: Holy Hostas, Batman! Last weekend was the American Hosta Society convention in Brookfield, WI. We were there as vendors and had a really great time meeting lots of new people and many people I've known for a few years from forums and facebook. Because we were busy vending, we didn't register for the full convention and weren't able to go on tour gardens etc. But I snapped a bunch of pics of vending and a few of the leaf show with my Ipod to share with all of you. First of course is our little corner of the vending space. We had a great assortment of plants for people, and sold out of some of our coolest plants. We had a pretty successful weekend, I think. Right next to us were some wonderful older ladies manning a booth of hosta-themed clothing, Designs by Audi. All hand made and unique. Our other neighbor was Jack Barta from Jack's Plants. He was convention co-chair, so was only in his booth half the time. Along with the ladies from Windswept Creations, we helped him out selling plants his plants. In The Country Gardens & Gifts was across from us and had a huge selection of plants and garden art. I almost picked up a Salix boydii as a stock plant, but someone nabbed it before my mind was made up. I will have to get this plant, it was adorable! Also near us, across from Jack's booth was Windswept Creations by Sandie Markland. She had some really great sea glass jewelry and pumice stone carvings. The stone spirits are really cool on her facebok page and website, but they are AMAZING in person. Naylor Creek Nursery had a great assortment of hostas, and this is where I bought 9 of the 10 new plants I picked up. Gary was a great guy to chat with and really helpful. As a testament to plant quality and selection, he only took 5 trays of plants home! Made in the Shade also had a nice selection of plants, 'Proud Sentry' is now on my list of plants to buy after seeing it in this booth. I took this pic near the end of vending day 2, you can see his sales were fairly good. I THOUGHT I snapped a booth shot of Green Hill, but apparently I only got his 2 planter bowls. Bob was selling some really cool newer hostas as well. He also had a large selection of minis. We helped Silvers-Elbert unload their huge selection of hostas. They had the most of anyone and all the plants looked great. Rich's Foxwillow Pines had a wonderful selection of conifers and maples. It was hard to resist buying something! Rich and Susan are always great people to talk with, it's been too long since I've been to the nursery, I'll have to visit this season. I did not catch her name or the name of her business, but there was a Native American woman selling jewelry made from ornamental corn. This was really cool stuff and reasonably priced and she was super interesting to talk with as well. Some varieties of indian corn, Oaxacan Green in the center. I also snapped a few pics of the leaf show, including some planted containers. These were all amazing!